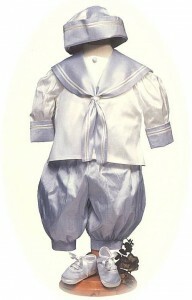 Boy’s christening gown and romper. A traditional solution for a baby boy’s christening. 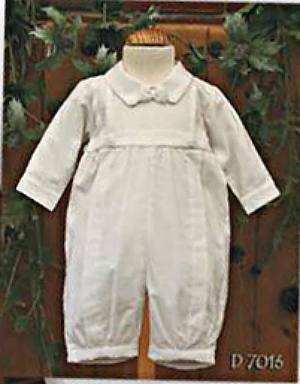 The long sleeved pure white romper in 100% cotton is topped by a detachable cotton skirt, which buttons around the waist of the romper. 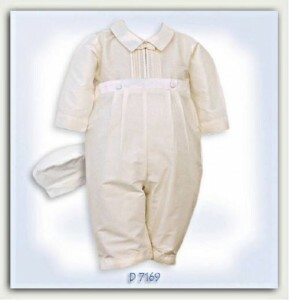 The bodice of the romper is decorated with pin tucks and has long sleeves, a collar and a smart bow tie. The romper buttons down the back and has a nappy placket for easy changing. 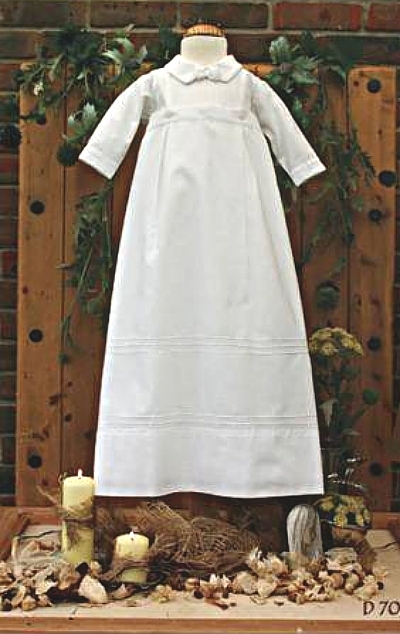 The fully lined, long white cotton skirt opens down the back. The hem of the skirt is decorated with pin tucks to match the romper. The outfit includes a matching hat with a peak, decorated with pin tucks. From the “Pretty Originals” collection.